A dentist treats a patient with the help of a dental assistant. Dentistry is important for overall health. Dental treatment is carried out by the dental team, which often consists of a dentist and dental auxiliaries (dental assistants, dental hygienists, dental technicians, and dental therapists). Most dentists work in private practices (primary care), although some work in dental hospitals and hospitals (secondary care) and institutions (prisons, armed forces bases, etc.). Dr. John M. Harris started the world's first dental school in Bainbridge, Ohio, and helped to establish dentistry as a health profession. It opened on 21 February 1828, and today is a dental museum. The first dental college, Baltimore College of Dental Surgery, opened in Baltimore, Maryland, USA in 1840. The second in the United States was the Philadelphia College of Dental Surgery, established in 1852. In 1907, Temple University accepted a bid to incorporate the school. Studies showed that dentists graduated from different countries, or even from different dental schools in one country, may have different clinical decisions for the same clinical condition. For example, dentists graduated from Israeli dental schools may recommend more often for the removal of asymptomatic impacted third molar (wisdom teeth) than dentists graduated from Latin American or Eastern European dental schools. In the United Kingdom, the 1878 British Dentists Act and 1879 Dentists Register limited the title of "dentist" and "dental surgeon" to qualified and registered practitioners. 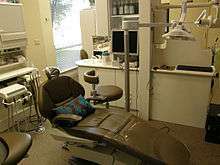 However, others could legally describe themselves as "dental experts" or "dental consultants". The practice of dentistry in the United Kingdom became fully regulated with the 1921 Dentists Act, which required the registration of anyone practising dentistry. The British Dental Association, formed in 1880 with Sir John Tomes as president, played a major role in prosecuting dentists practising illegally. In Korea, Taiwan, Japan, Finland, Sweden, Brazil, Chile, the United States, and Canada, a dentist is a healthcare professional qualified to practice dentistry after graduating with a degree of either Doctor of Dental Surgery (DDS) or Doctor of Dental Medicine (DMD). This is equivalent to the Bachelor of Dental Surgery/Baccalaureus Dentalis Chirurgiae (BDS, BDent, BChD, BDSc) that is awarded in the UK and British Commonwealth countries. In most western countries, to become a qualified dentist one must usually complete at least four years of postgraduate study; within the European Union the education has to be at least five years. Dentists usually complete between five and eight years of post-secondary education before practising. Though not mandatory, many dentists choose to complete an internship or residency focusing on specific aspects of dental care after they have received their dental degree. 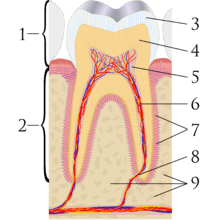 Tooth decay was low in pre-agricultural societies, the growth in farming society about 10,000 years ago correlated with an increase with the rate of cavities. An infected tooth from Italy partially cleaned with flint tools, between 13,820 and 14,160 years old, represents the oldest known dentistry. The Indus Valley Civilization (IVC) has yielded evidence of dentistry being practised as far back as 7000 BC. An IVC site in Mehrgarh indicates that this form of dentistry involved curing tooth related disorders with bow drills operated, perhaps, by skilled bead crafters. The reconstruction of this ancient form of dentistry showed that the methods used were reliable and effective. The earliest dental filling, made of beeswax, was discovered in Slovenia and dates from 6500 years ago. A Sumerian text from 5000 BC describes a "tooth worm" as the cause of dental caries. Evidence of this belief has also been found in ancient India, Egypt, Japan, and China. The legend of the worm is also found in the writings of Homer, and as late as the 14th century AD the surgeon Guy de Chauliac still promoted the belief that worms cause tooth decay. Recipes for the treatment of toothache, infections and loose teeth are spread throughout the Ebers Papyrus, Kahun Papyri, Brugsch Papyrus, and Hearst papyrus of Ancient Egypt. The Edwin Smith Papyrus, written in the 17th century BC but which may reflect previous manuscripts from as early as 3000 BC, discusses the treatment of dislocated or fractured jaws. In the 18th century BC, the Code of Hammurabi referenced dental extraction twice as it related to punishment. Examination of the remains of some ancient Egyptians and Greco-Romans reveals early attempts at dental prosthetics. However, it is possible the prosthetics were prepared after death for aesthetic reasons. Ancient Greek scholars Hippocrates and Aristotle wrote about dentistry, including the eruption pattern of teeth, treating decayed teeth and gum disease, extracting teeth with forceps, and using wires to stabilize loose teeth and fractured jaws. Some say the first use of dental appliances or bridges comes from the Etruscans from as early as 700 BC. In ancient Egypt, Hesi-Re is the first named "dentist" (greatest of the teeth). The Egyptians bound replacement teeth together with gold wire. Roman medical writer Cornelius Celsus wrote extensively of oral diseases as well as dental treatments such as narcotic-containing emollients and astringents. The earliest dental amalgams were first documented in a Tang Dynasty medical text written by the Chinese physician Su Kung in 659, and appeared in Germany in 1528. Historically, dental extractions have been used to treat a variety of illnesses. 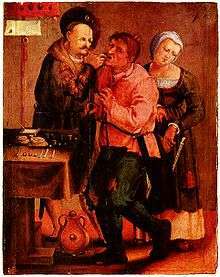 During the Middle Ages and throughout the 19th century, dentistry was not a profession in itself, and often dental procedures were performed by barbers or general physicians. Barbers usually limited their practice to extracting teeth which alleviated pain and associated chronic tooth infection. Instruments used for dental extractions date back several centuries. In the 14th century, Guy de Chauliac invented the dental pelican (resembling a pelican's beak) which was used to perform dental extractions up until the late 18th century. The pelican was replaced by the dental key which, in turn, was replaced by modern forceps in the 20th century. The first book focused solely on dentistry was the "Artzney Buchlein" in 1530, and the first dental textbook written in English was called "Operator for the Teeth" by Charles Allen in 1685. In the United Kingdom there was no formal qualification for the providers of dental treatment until 1859 and it was only in 1921 that the practice of dentistry was limited to those who were professionally qualified. The Royal Commission on the National Health Service in 1979 reported that there were then more than twice as many registered dentists per 10,000 population in the UK than there were in 1921. The Egyptian Mummies that I have seen, have had their Mouths open, and somewhat gaping, which affordeth a good opportunity to view and observe their Teeth, wherein 'tis not easie to find any wanting or decayed: and therefore in Egypt, where one Man practised but one Operation, or the Diseases but of single Parts, it must needs be a barren Profession to confine unto that of drawing of Teeth, and little better than to have been Tooth-drawer unto King Pyrrhus, who had but two in his Head. The French surgeon Pierre Fauchard became known as the "father of modern dentistry". Despite the limitations of the primitive surgical instruments during the late 17th and early 18th century, Fauchard was a highly skilled surgeon who made remarkable improvisations of dental instruments, often adapting tools from watch makers, jewelers and even barbers, that he thought could be used in dentistry. He introduced dental fillings as treatment for dental cavities. He asserted that sugar derivate acids like tartaric acid were responsible for dental decay, and also suggested that tumors surrounding the teeth and in the gums could appear in the later stages of tooth decay. Fauchard was the pioneer of dental prosthesis, and he discovered many methods to replace lost teeth. He suggested that substitutes could be made from carved blocks of ivory or bone. He also introduced dental braces, although they were initially made of gold, he discovered that the teeth position could be corrected as the teeth would follow the pattern of the wires. Waxed linen or silk threads were usually employed to fasten the braces. His contributions to the world of dental science consist primarily of his 1728 publication Le chirurgien dentiste or The Surgeon Dentist. The French text included "basic oral anatomy and function, dental construction, and various operative and restorative techniques, and effectively separated dentistry from the wider category of surgery". 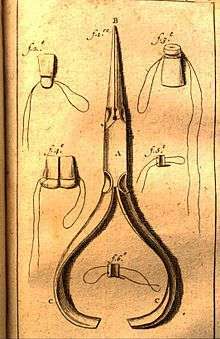 After Fauchard, the study of dentistry rapidly expanded. Two important books, Natural History of Human Teeth (1771) and Practical Treatise on the Diseases of the Teeth (1778), were published by British surgeon John Hunter. In 1763 he entered into a period of collaboration with the London-based dentist James Spence. He began to theorise about the possibility of tooth transplants from one person to another. He realised that the chances of an (initially, at least) successful tooth transplant would be improved if the donor tooth was as fresh as possible and was matched for size with the recipient. These principles are still used in the transplantation of internal organs. Hunter conducted a series of pioneering operations, in which he attempted a tooth transplant. Although the donated teeth never properly bonded with the recipients' gums, one of Hunter's patients stated that he had three which lasted for six years, a remarkable achievement for the period. Major advances were made in the 19th century, and dentistry evolved from a trade to a profession. The profession came under government regulation by the end of the 19th century. In the UK the Dentist Act was passed in 1878 and the British Dental Association formed in 1879. In the same year, Francis Brodie Imlach was the first ever dentist to be elected President of the Royal College of Surgeons (Edinburgh), raising dentistry onto a par with clinical surgery for the first time. UK NHS priority patients include patients with congenital abnormalities (such as cleft palates and hypodontia), patients who have suffered orofacial trauma and those being treated for cancer in the head and neck region. These are treated in a multidisciplinary team approach with other hospital based dental specialities orthodontics and maxillofacial surgery. Other priority patients include those with infections (either third molars or necrotic teeth) or avulsed permanent teeth, as well as patients with a history of smoking or smokeless tobacco with ulcers in the oral cavity. ↑ Whether Dentists are referred to as "Doctor" is subject to geographic variation. For example, they are called "Doctor" in the USA. In the UK, dentists have traditionally been referred to as "Mister" as they identified themselves with barber surgeons more than physicians (as do surgeons in the UK, see Surgeon#Titles). However more UK dentists now refer to themselves as "Doctor", although this is generally viewed as misleading by the British public (see Costley and Fawcett 2010). ↑ The scope of Oral and maxillofacial surgery is variable. In some countries, both a medical and dental degree is required for training, and the scope includes head and neck oncology and craniofacial deformity. 1 2 "Stone age man used dentist drill". BBC News. 6 April 2006. Retrieved 24 May 2010. ↑ Suddick, RP; Harris, NO (1990). "Historical perspectives of oral biology: a series". Critical Reviews in Oral Biology and Medicine. 1 (2): 135–51. doi:10.1177/10454411900010020301. PMID 2129621. ↑ Owen, Lorrie K., ed. Dictionary of Ohio Historic Places. Vol. 2. St. Clair Shores: Somerset, 1999, 1217–1218. ↑ "History". Pennsylvania School of Dental Medicine. Retrieved 13 January 2016. ↑ Zadik Yehuda; Levin Liran (January 2008). "Clinical decision making in restorative dentistry, endodontics, and antibiotic prescription". J Dent Educ. 72 (1): 81–6. PMID 18172239. ↑ Zadik Yehuda; Levin Liran (April 2006). "Decision making of Hebrew University and Tel Aviv University Dental Schools graduates in every day dentistry—is there a difference?". J Isr Dent Assoc. 23 (2): 19–23. PMID 16886872. ↑ Zadik Yehuda; Levin Liran (April 2007). "Decision making of Israeli, East European, and South American dental school graduates in third molar surgery: is there a difference?". J Oral Maxillofac Surg. 65 (4): 658–62. doi:10.1016/j.joms.2006.09.002. PMID 17368360. Retrieved 16 July 2008. 1 2 Gelbier, Stanley. 125 Years of Developments in Dentistry. British Dental Journal (2005); 199, 470–473. Page accessed 11 December 2007. The 1879 register is referred to as the "Dental Register". 1 2 The story of dentistry: Dental History Timeline Archived 9 March 2012 at the Wayback Machine., hosted on the British Dental Association website. Page accessed 2 March 2010. ↑ "Failure of Act". The Glasgow Herald. 8 February 1955. Retrieved 2 March 2010. ↑ History of Dental Surgery in Edinburgh (PDF), hosted on the Royal College of Surgeons of Edinburgh website. Page accessed 11 December 2007. ↑ "AVDC Home". Avdc.org. 29 November 2009. Retrieved 18 April 2010. ↑ "EVDC web site". Evdc.info. Retrieved 18 April 2010. ↑ Barras, Colin (29 February 2016). "How our ancestors drilled rotten teeth". BBC. Retrieved 1 March 2016. ↑ "Oldest Dentistry Found in 14,000-Year-Old Tooth". Discovery Channel. 16 July 2015. Retrieved 21 July 2015. ↑ Coppa, A. et al. 2006. "Early Neolithic tradition of dentistry" (PDF). Nature. Volume 440. 6 April 2006. ↑ "History of Dentistry: Ancient Origins". American Dental Association. Archived from the original on 16 July 2007. Retrieved 9 January 2007. ↑ Suddick, Richard P. and Norman O. Harris. "Historical Perspectives of Oral Biology: A Series" (PDF). Critical Reviews in Oral Biology and Medicine, 1(2), pages 135–151, 1990. 1 2 3 Blomstedt, P. (2013). "Dental surgery in ancient Egypt". Journal of the History of Dentistry. 61 (3): 129–142. PMID 24665522. ↑ Ancient Egyptian Dentistry, hosted on the University of Oklahoma website. Page accessed 15 December 2007. Version archived by the Wayback Machine on 26 December 2007. ↑ Wilwerding, Terry. "History of Dentistry 2001" (PDF). Retrieved 3 November 2014. ↑ "Medicine in Ancient Egypt 3". Arabworldbooks.com. Retrieved 18 April 2010. 1 2 "History Of Dentistry". Complete Dental Guide. Retrieved 29 June 2016. ↑ "History of Dentistry Research Page, Newsletter". Rcpsg.ac.uk. Retrieved 9 June 2014. ↑ "Dentistry – Skill And Superstition". Science.jrank.org. Retrieved 18 April 2010. ↑ "Dental Treatment in the Ancient Times". Dentaltreatment.org.uk. Archived from the original on 1 December 2009. Retrieved 18 April 2010. ↑ Bjørklund G (1989). "The history of dental amalgam (in Norwegian)". Tidsskr nor Laegeforen. 109 (34–36): 3582–3585. PMID 2694433. ↑ Czarnetzki, A.; Ehrhardt S. (1990). "Re-dating the Chinese amalgam-filling of teeth in Europe". International Journal of Anthropology. 5 (4): 325–332. 1 2 "Antique Dental Instruments". Dmd.co.il. Retrieved 18 April 2010. ↑ Royal Commission on the NHS Chapter 9. HMSO. July 1979. ISBN 0-10-176150-3. Retrieved 19 May 2015. 1 2 André Besombes; Phillipe de Gaillande (1993). Pierre Fauchard (1678–1761): The First Dental Surgeon, His Work, His Actuality. Pierre Fauchard Academy. 1 2 Bernhard Wolf Weinberger (1941). Pierre Fauchard, Surgeon-dentist: A Brief Account of the Beginning of Modern Dentistry, the First Dental Textbook, and Professional Life Two Hundred Years Ago. Pierre Fauchard Academy. ↑ Moore, Wendy (30 September 2010). The Knife Man. Transworld. pp. 223–224. ISBN 978-1-4090-4462-8. Retrieved 8 March 2012. ↑ Dingwall, Helen (April 2004). "A pioneering history: dentistry and the Royal College of Surgeons of Edinburgh" (PDF). History of Dentistry Newsletter (14). Look up dentistry in Wiktionary, the free dictionary. Wikimedia Commons has media related to Dentistry.